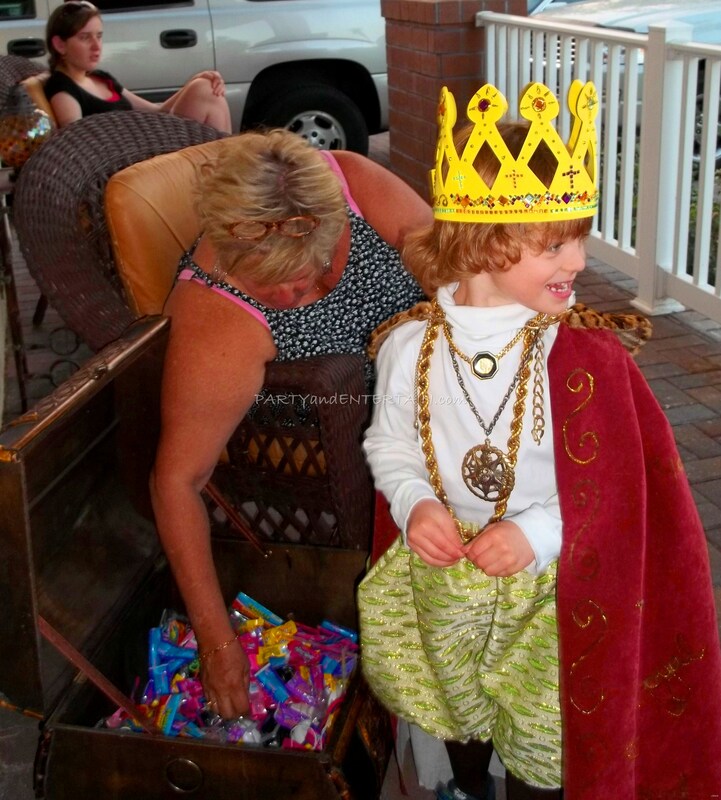 Halloween and trick or treating has always been a favorite time for me. As a child I loved trick or treating, with all my friends, in the costumes my Mom made. 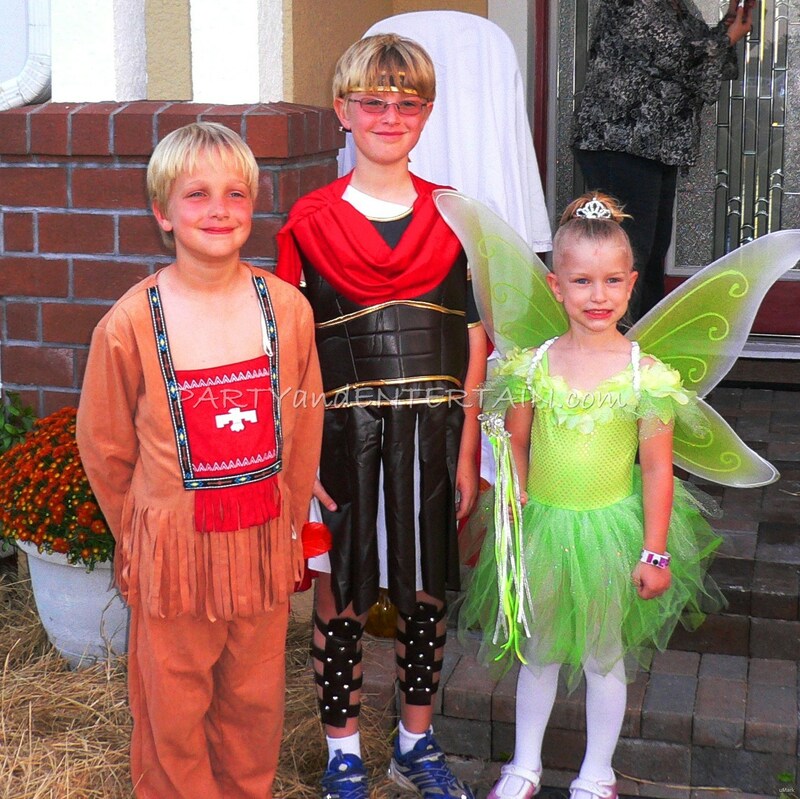 As a young Mother I enjoyed creating costumes from my children’s ideas and watching them go out the door to go treat or treating with their friends. Now I am taking my Mother’s role and enjoy welcoming the children who come to our house for their treats on Halloween night. 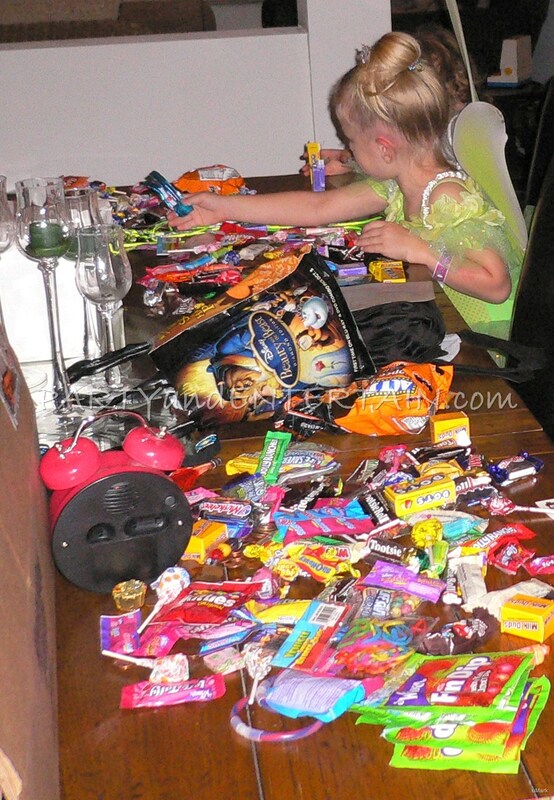 I remember when my children came home with their bags full of candy. Back then they were given the big candy bars, not the snack size that is generally passed out today. Anyway, I do remember their bags full of sugary sweet delights… I had such a hard time not taking all the Butterfinger and Clark bars for myself. Yes, I would sneak into their bags when they went to school the next day, but I always left their favorites in the bag. So, now I am older and my mind set has changed. I would love to give all the children huge candy bars, but what will I do with the ones left over? Yes, you are right. I would eat them for days after Halloween. I have tried buying candy that I didn’t like, but then I end up with wasted candy sitting around the house that no one will eat. What a waste of money that is! About five years ago, I waited till the last minute to get the Halloween goodies for “trick or treat”. Instead of buying candy I went to my party stash closet. You know the one where you stash those little trinkets you buy for your grandkids, the party favors you have left over from those birthday parties, the little trinkets you buy at garage sales (I once bought a case of yoyo’s). I found a trunk somewhere in the house and proceeded to dump everything in the trunk. 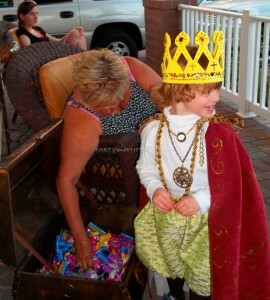 I took a comfortable chair to the front porch along with a glass of wine and the trunk filled with my treats. 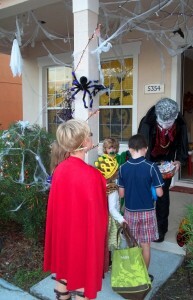 It was a huge success for me and my “trick or treat” guests. Another fun and successful treat I shared was a bucket full of pennies! We had been saving pennies for years in a huge glass bottle. Just so happened the jar broke the day of “trick or treat”. I carefully picked up all the pennies, put them in a bucket, took them to the front porch, placed the bucket beside my trunk of goodies and I sat in my faithful chair. As the children came up I let them take one goodie and a handful of pennies! You would have thought I was giving away a million dollars! They went running down the street telling everyone about the house that was giving away money! !